Meningioma may present as encapsulated round mass with dural base. There will be a calcified psammoma bodies and the present in the parasagittal region or at the convexities of the cerebral hemisphere. There will also be whorled pattern of tight packed tumor cells. Meningioma is a benign slow growing tumor which does not infiltrate the brain. 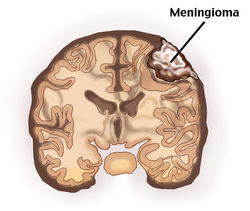 Meningioma may arises from meningothelial cells of the arachnoid. Meningioma may present with signs and symptoms such as nausea, vomiting, raised intracranial pressure, seizures, and headaches due to the compression of the brain. Meningioma commonly affecting women. Patient with neurofibromatosis type 2 may present with multiple meningioma. Meningioma carries a good prognosis with the main treatment is surgical removal of the tumor. 1.Martin Rohringer, Garnette R. Sutherland, Deon F. Louw, and Anders A. F. Sima. “Incidence and Clinicopathological Features of Meningioma.” Research-article. May 8, 2009. 2.Lapresle, Jean, Martin G. Netsky, and H. M. Zimmerman. “The Pathology of Meningiomas.” The American Journal of Pathology 28, no. 5 (October 1952): 757–791.